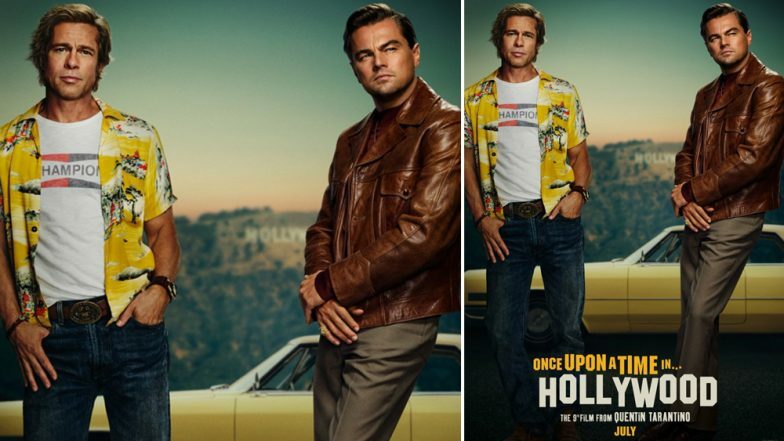 Quentin Tarantino's 'Once Upon a Time in Hollywood' Poster: Leonardo DiCaprio and Brad Pitt Sharing The Same Frame Sends The Internet Into a Tizzy! These two Hollywood heavy-weights are perhaps the only two name that the mango people in India take refuge in, when it comes to sharing or boasting about the acumen of Hollywood movies. Naturally, the duo sharing the same frame in the first poster of Quentin Tarantino's forthcoming film Once Upon A Time in Hollywood has sent fans into a tizzy of sorts, in this part of the globe. The poster does look gorgeous with Leo and Pitt making their super-starry presence felt with the unmissable retro feel on display. Quentin Tarantino's return to the big screen is arriving later this year. Touted as a production that has Tarantino's most impressive cast to-date the movie features Leonardo DiCaprio, Brad Pitt, Margot Robbie, Al Pacino, Timothy Olyphant, Dakota Fanning, Kurt Russell, Luke Perry James Marsden, Emile Hirsch, Tim Roth, Margaret Qualley, Damian Lewis. Lena Dunham, and Bruce Dern. Al Pacino Birthday Special: 10 Movie Dialogues of the Legend That Never Cease to Be Utterly Quotable!